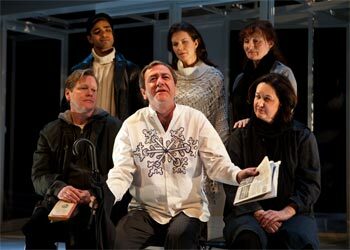 Last night I saw And Slowly Beauty… at Tarragon Theatre. Sometimes I need time to think about a play before I write a review. I’ve been thinking about And Slowly Beauty… all day. I enjoyed it and highly recommend it. It’s the story of Mr. Mann, a civil servant who wins tickets to a play and goes to see it on his own because his wife and grown children are all busy. The play – a modern production of Chekhov’s Three Sisters – awakens something inside him and the beauty of the piece makes him see the emptiness of his hum-drum life and slowly transforms him. Mr Mann is played by Dennis Fitzgerald. The five other cast members – Caroline Gillis, Shawn Ahmed, Celine Stubel, Mary-Colin Chisholm, and Christian Murray – play multiple roles. My friend Pat really enjoyed the production. She found it quite moving with moments of genuine wit. She also liked the way that Three Sisters was interwoven through the play. She commented on the interesting choreography, something I also found fascinating. The scene changes were all done by the cast moving chairs and tables in unison. Very much a dance. Costume changes were minimal but some of them were accomplished by one cast member handing off a piece of clothing to another person in the cast. The choreographed movement seemed to set the pace of the piece which felt almost fluid. Everything worked together; the music was never intrusive but added to the atmosphere. All of the actors did a wonderful job and it doesn’t seem fair to single anyone out but… Dennis Fitzgerald was excellent as Mr. Mann. His facial expressions are so nuanced, you can read all the character’s feeling on his face. I loved the set. It’s a metal frame with glass doors and windows. The lighting was very effective in dividing the space. And Slowly Beauty… was written by Michel Nadeau (in French) and translated by Maureen Labonte. I thought I could hear a French cadence through the dialogue but Pat didn’t notice it. It’s a wonderful play, one that will stay with you for a while. It made me realize how important theatre is to me and what a drab place life would be without it.